It is a gentle touch operation that is designed to produce a premium product. A team of sorters diligently exams every apple as it passes. This is the first line of defense, eliminating obvious defects and culls to ensure the quality of our fruit. Orchard bins are automatically picked up and gently lowered into a water tank and the apples gently float out. They then flow down a flume of water for their first rinse and then proceed up an elevator to a sorting section. The fruit is washed using food grade detergent. Each apple tumbles across the brush rollers getting a gentle cleaning and polishing. They are then rinsed and dried before heading to the waxing section. This process is important because it removes any orchard debris and the natural wax coating of the apple. Here the apples are sprayed with a thin layer of food grade carnauba wax. Again they tumble along the gentle brush rollers making their way to the dryer to cure, getting perfectly polished along the way. 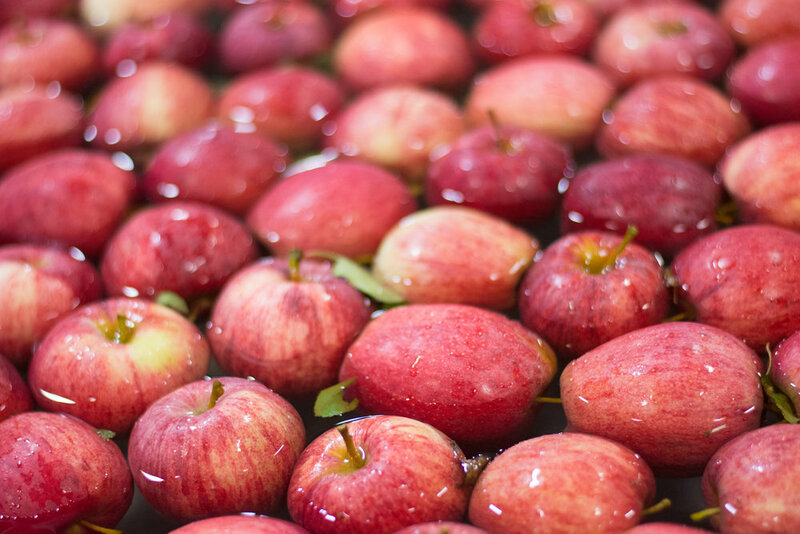 Wax is important to the apples because not only does it make them look presentable for retail shelves, but it also plays an important role in reducing water loss and maintaining optimal freshness until it reaches the consumer. This is why we add a plant based wax to the fruit. Emerging from the tunnel the apples flow on to an electronic weight sizer and color sorter. The color sorter and scale are used to determine the grade and size of the fruit which allows the operator to direct where the fruit is to be delivered for packaging. Medium sized apples are conveyed to the bagging section. Our semi-automatic bagging line gently weighs the fruit and places them in various size polybag packs. The bags are sealed and packed into a master carton. 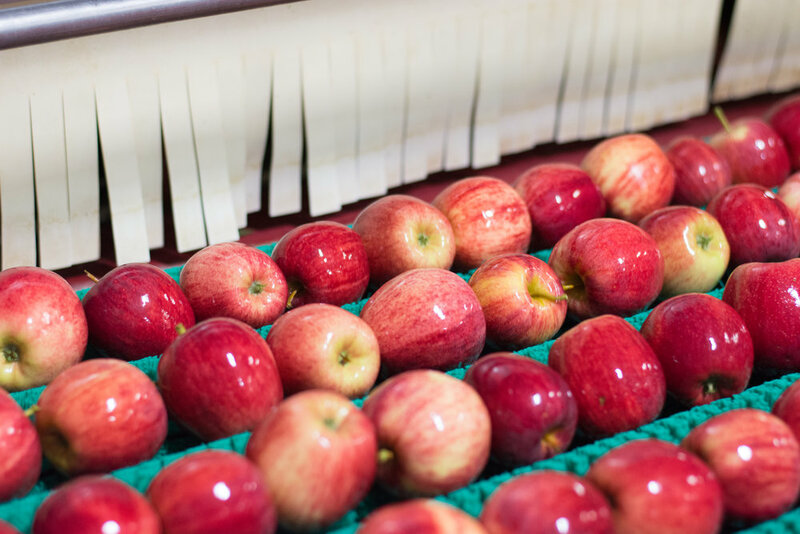 Larger fruit is carried to the tray packing section where apples receive a final sort to ensure a premium pack. 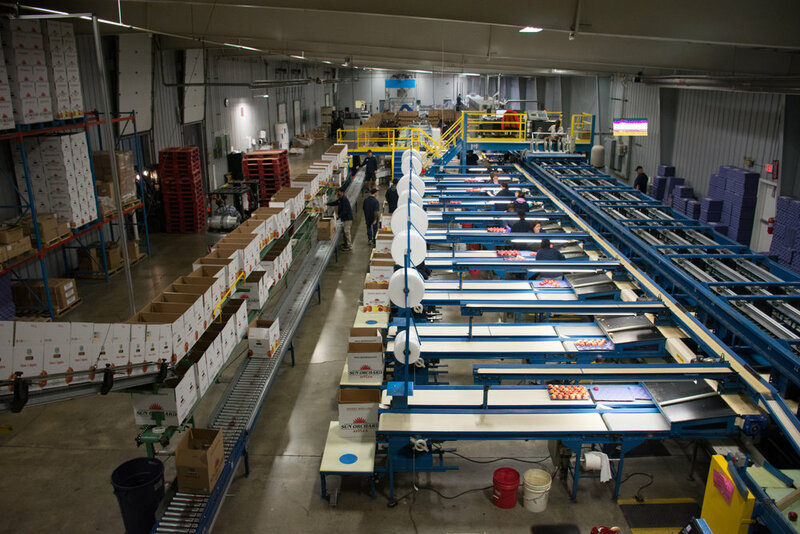 Each apple is packed with care by hand and placed in trays which are stacked in cartons to be shipped to our valued retailers. Off to a valued retailer near you! Finally the cartons are carried by conveyor through an automatic carton sealer, where the boxes are coded and stacked on pallets. The pallets are placed in cold storage to be shipped soon after to retail clients. Are you looking for the highest quality, best tasting apples out there to put on your retail shelves? Look know further, fill out an information form by clicking the button below and get in touch with Sun Orchard Sales team to learn what we can do for you!